Whilst redecorating her flat, Emma removes a strip of old wallpaper to reveal written beneath, "Mrs. Peel." 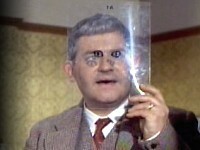 Steed enters and removes another strip of wallpaper to reveal, "We're Needed!" 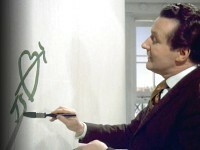 Whilst redecorating Emma's flat, Steed paints some revealing graffiti on the wall (see the image). Is an escaped lion or tiger on the loose, mauling businessmen and prize bulls to death? Steed goes on safari to track down the "big cat," but his hunting partner is murdered—whilst locked inside a protective cage! Eventually the tenuous clues lead them to P.U.R.R.R., the Philanthropic Union for the Rescue, Relief and Recuperation of Cats. Finally! A bona-fide four-bowler color episode, and a serious treat it is—particularly for cat-lovers such as myself (I had a cat named Emma, BTW, and she was reddish-brown). Worthwhile for the copious double-entendres and inside jokes alone. Mr. Cheshire is a classic goofball, particularly when he's "on the bottle." The fact that his involvement in the scheme was never clarified is not enough to threaten the episode's top-ten status—as one fan put it, plot was always secondary on The Avengers. Wonderful little giggle from Emma at the very end when we learn of Steed's true feelings toward her—as if we didn't already know. Gabrielle Drake (Angora) was one of several actresses screen-tested to replace Diana Rigg. Acronym Alert: PURRR is the Philanthropic Union for the Rescue, Relief and Recuperation of Cats. North Mymms Park, Welham Green, was the setting of P.U.R.R.R. Quite a few of them in this episode. The best include first Steed and then Emma describing their respective "pets" to Mr. Cheshire. Steed's lines are detailed above; Emma refers to Little John as being "very bad tempered first thing in the morning... until he's had his first glass of champagne." Followed by a close third, the Jones phone book sequence. "He's the heavyweight champion of where?" And don't forget the tag! There's a bevy of them! A sample: After taking the particulars for Steed's cat, Emma, Mr. Cheshire remarks, "And what a joy for you it must be when she's curled up in your lap."